Stolonifera is one of the more recently available salvias from Oaxaca. Mexico. It is a small plant to about 50cm high with stolons which increase its width in time. It is a nice orangey colour set off by the violet shaped, thickly textured leaves. The foliage is winter dormant. 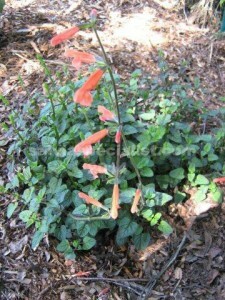 Stolonifera can be propagated by summer cuttings.